Surveying Tapes: Types of Measuring Tape Used in Survey. In this article, you are going to learn many things about surveying tapes and its types in details. Types of Measuring Tape Used in Survey. 1. Cloth or linen tapes. 2. Metric woven metallic tapes. The availability of long tapes has considerably increased the accuracy in surveying without involving any undue waste of labor or of time. You’ll know different types of Measuring Tapes used in Survey here. Measuring Tapes are now available in different lengths and widths. But for comparatively short lengths to be measured, a tape of 30 meter long and 6 mm wide will be probably found as a more convenient size. Surveying tapes are made of various materials and therefore can be divided into different types as follows. This tape is used for taking offsets. It consists of a varnished strip of woven linen 12 to 16 mm wide and it is attached to a spindle in a leather case into which it is wound. It is generally available in lengths of 10, 20, 30 and 50 meters. At the end of the tape is provided a brass ring whose length is included in the first hinge. The tape is very light and handy. These should not be used for accurate measurements as they are subjected to variation in length. They stretch when the pull is exercised and may be elongated permanently. Its exposure to dampness causes shrinking. These are not durable, and care should be taken in use as figures become illegible very soon. It is not very commonly used in Surveying and Levelling. They are better than the linen tapes, but are not suited for precise works. They are meant chiefly for taking offsets and subsidiary measurements. The metric woven metallic tapes are manufactured in lengths of 2, 5, 10, 20, 30 and 50 meters. The length of the tape includes the metal finger ring when provided. At every centimeter a black line 8 to 10 mm in height is drawn, and every five centimeters, are marked with an arrow in black. Every decimeter and meter is marked to the full width (i.e. 16 mm) of the tape by a line. The decimeters are marked in black and meters in red figures. The tapes are manufactured from yarn and metal wire. The yarn is spun from good quality cotton or linen, and the wire is of phosphor bronze, copper or stainless steel and is 0.16 mm (or 38 SWG) in diameter. The tape should be coated with a suitable primer of synthetic material over which one or more coats of a flexible and high quality enamel should be given. The coating must be non-cracking and water resistant. In case of tapes of denominations 10, 20, 30 and 50 meters, a metal ring is attached to the outer end of size tape. The outer end of the tapes of these denominations must be reinforced over a length of not less than 10 cm by a strip of cotton fabric or suitable plastic material. Over which a strip of brass or any other suitable material should be rigidly fixed for protection and for receiving the inspector’s stamp. The tapes of 2 and 5 meters should also have this arrangement. Read More: Theodolite Parts and Functions [A Detailed Guide]. The permissible error in the length of the tape, when supported on a horizontal surface under a tension of one kilogram shall not exceed the following limits according to IS: 1269-1958. In addition, in the case of 20, 30, and 50 meter tapes, the permissible error from the beginning of the tape to the lengths specified below shall not exceed the following limits. The 10, 20, 30, and 50 meter tapes are supplied in a case made of leather or corrosion-resisting metal, fitted with a winding device. The handle for the winding device should be suitable for Winding the tape on the reel. It shall fold against the reel and should have a crank length of not less than 25 mm. On the un-graduated side and also on the ease of each tape when provided, the name of the manufacturer or his registered trademark and the denomination is legibly marked in English. The purchaser can also get the year of manufacture marked on the ease. 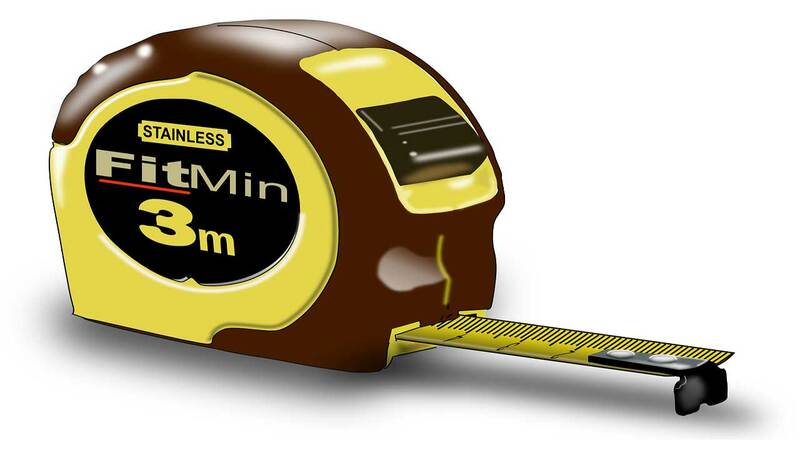 Watch the Video Below to Learn How to Read a Tape Measure. They are used for accurate works and are made of Steel or of stainless steel. The outer end of the tape is provided with a ring or other device for facilitating withdrawal. The ring or other device is fastened to the tape by a metal strip of the same width as the metric woven tape. The denominations of these tape measures are 1, 2, 10, 20, 30 and 50 meters. The most common lengths being 20, 30 and 50 m.
The tapes are marked on one side only, with a line at every five millimeter, centimeter, decimeter, and meter, the first decimeter having the millimeters also marked on the tape. The meter division, in addition, bears the designation to every centimeter in the first decimeter is marked. The ends 20, 30, and 50 meter tapes are marked with the words ‘meter’. These surveying tapes are lighter and delicate and get broken easily. The winding device is of substantial construction and is such that when the tape is withdrawn by hand to any point up to the limit of its measuring capacity. It holds its withdrawn length, and when the ‘finger release device’ is pressed, the tape automatically rewinds into the case. The case is made of corrosion resisting metal or of a metal with a non-corrosive finish. After the work is over, they are wiped clean and oiled. If broken they can be mended by riveting a piece of tape of the same width to its back. They are available in the width of 6, 9.5, 13, 16 mm. etc., according to IS: 1270-1959. These types of surveying tapes are used for the highest precision works, e.g., for the measurements of base lines, etc. in triangulation work. Invar is an alloy containing 36% nickel and 64% steel. The main advantage of this alloy is that it has got a very low co-efficient of thermal expansion. It is available in various lengths, the width being 6 mm. It is wound on a metal reel of 25 cm in diameter. It is very costly and delicate and therefore used with the greatest care. It should not be used for ordinary work. Read More: Types of Levelling Instruments used in Surveying.